If I had to use one word to describe Will and Nikki then it would be ‘adorable’. 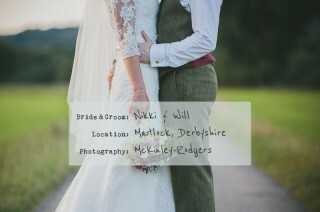 I’ve never met them admittedly but the photos from their glorious rustic outdoorsy affair show the sweetest couple who are very much in love. 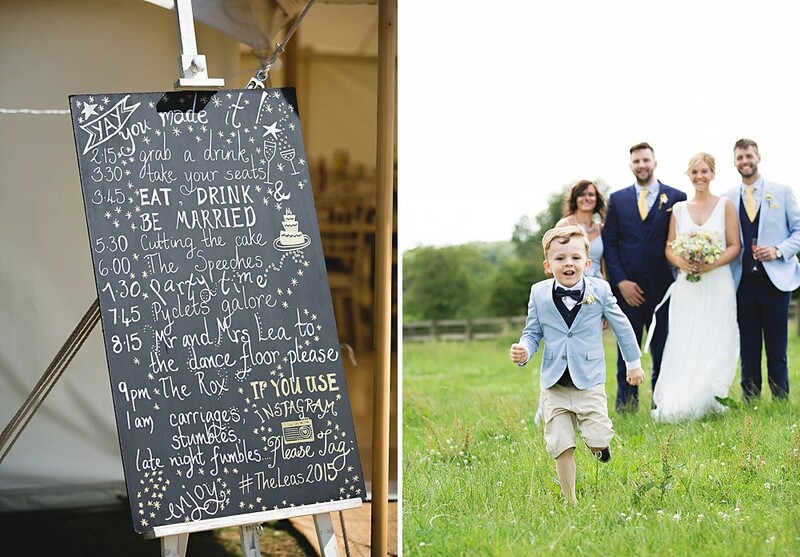 There are plenty of gorgeous thoughtful details too, from the hand-scrawled signage at both the ceremony and the reception, the wonderful stationery, the guestbook and the table plan. Oh man…just wait until you see the table plan! And those portrait shots on the hay bales and Range Rover? Genius. Nikki The Bride: Will and I got married on my parent’s farm just outside Matlock, Derbyshire on Saturday the 10th of August, 2013. After Will proposed on NYE 2011, our initial plan was to have a small, low key wedding with just a few close family and friends. We did the total opposite! There were several reasons for this but we’re so pleased with the decision we made – our day was incredible. 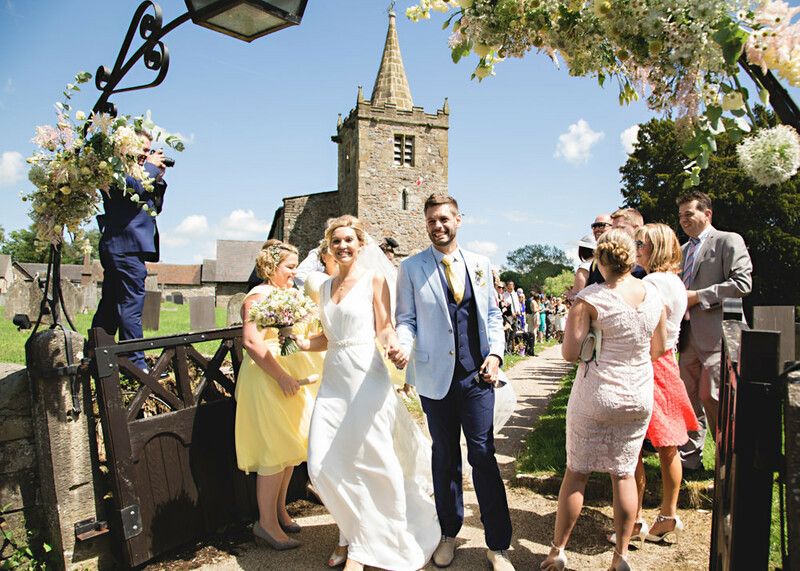 Having been to more weddings than we’ve had hot dinners over the last few years, we were able to get a feel for the things we liked and certain aspects of ‘the big day’ that appealed to us. We knew that a stately home or a fancy hotel wasn’t our cup of tea and to get married at home with such wonderful memories of growing up meant something to us. 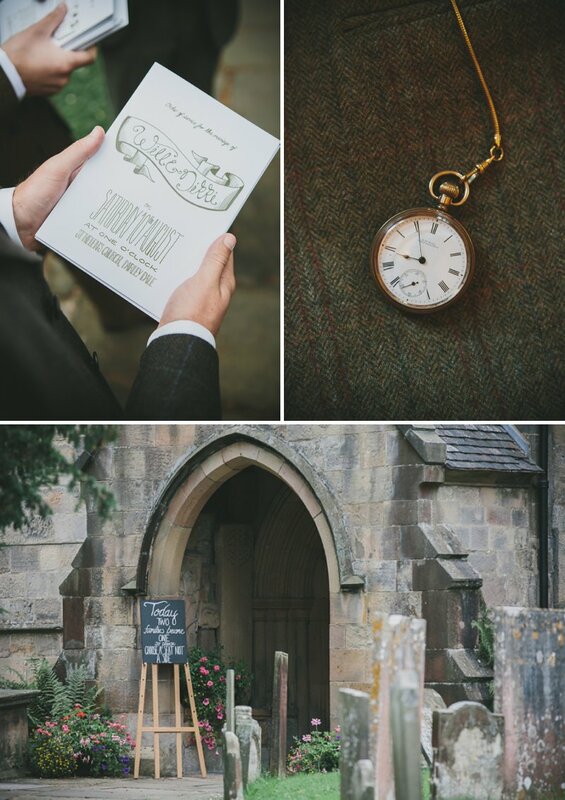 Being on the edge of the Peak District with its rolling green hills and pretty villages provided a great backdrop and we married at the local parish church, St.Helen’s before making the short trip back to the farm to our reception in a traditional pole marquee provided bySimon Bond. With absolutely no restrictions on the number of guests, what menu to choose from or wine to select, we were able to make our day really personal. 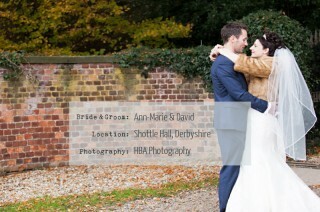 My dress was from a shop called Darcy Weddings in Morpeth just north of Newcastle upon Tyne where we live. 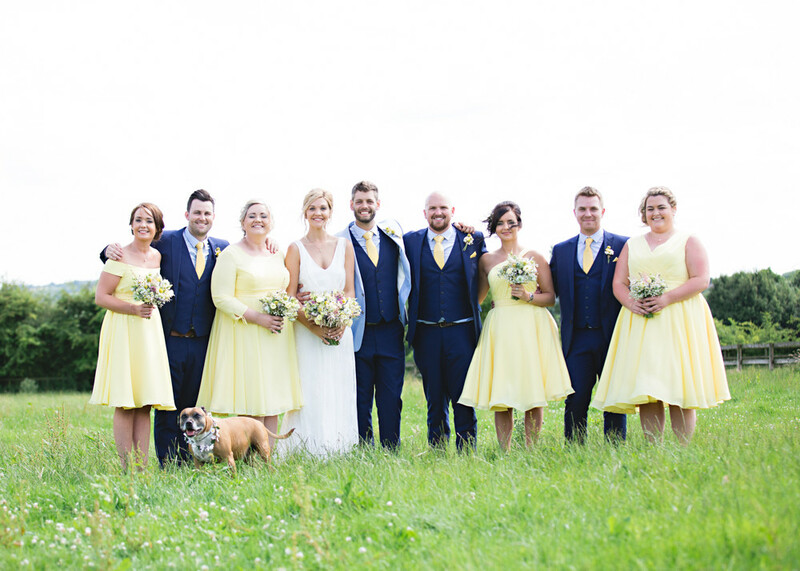 Having been a bridesmaid the previous year, I’d met Jennifer and the girls in the shop already and knew how lovely and down to earth they were. When you’re going to part with that much money on a dress I think the service you receive is really important and after several visits I couldn’t have been happier. I chose quite a traditional fitted lace dress with sleeves that was designed by Ronald Joyce. I didn’t necessarily have the OMG this is ‘the one’ feeling but I knew out of the dozen or so I’d tried on beforehand that this was one I felt the most comfortable in. I had a brief idea of what I hoped to find and this was pretty much it. I wanted my hair to tie in with the rustic country feel of the wedding so I decided on a baby gypsophila head crown. I had a veil from Darcy’s which I think I was supposed to take off after the ceremony but it stayed on for pretty much the whole day! As for jewellery, I borrowed some antique teardrop earrings from my mum and wore a simple Tiffany bracelet that I opened on the morning of the wedding bought by my wonderful husband. I managed to find some closed-toe lacey little numbers that went perfectly with my dress. I got them in John Lewis, nothing fancy, very simple and having spent a day in a field and all night on the dance-floor, they’re certainly never going to be worn again! Two very lovely ladies had the challenge of making me look pretty on my wedding day. My hair stylist Sarah Britner was superb and created the look I wanted with such effortlessness. I decided to keep things simple and have my hair down with loose curls wrapped around my floral headpiece. I knew I was in capable hands when I had my trial earlier in the year and she did a fine job with the bridesmaids too. 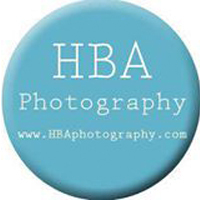 Nicola Boden hid all my imperfections and provided a simple, natural look with make-up. I don’t generally wear a lot so I knew I didn’t want anything too heavy. I was conscious of the fact that many brides are totally transformed on their day and can quite often be unrecognisable. I still wanted to look like me and I was thrilled with the final result. We couldn’t have been happier with our flowers from Kerry at Tineke Floral Designs. 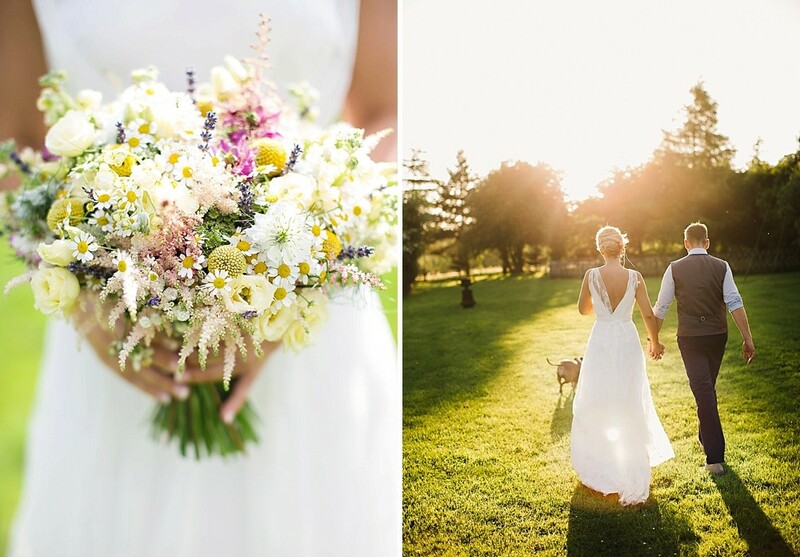 Being in a field, we wanted a hand-picked, natural bouquet with no particular colour scheme. 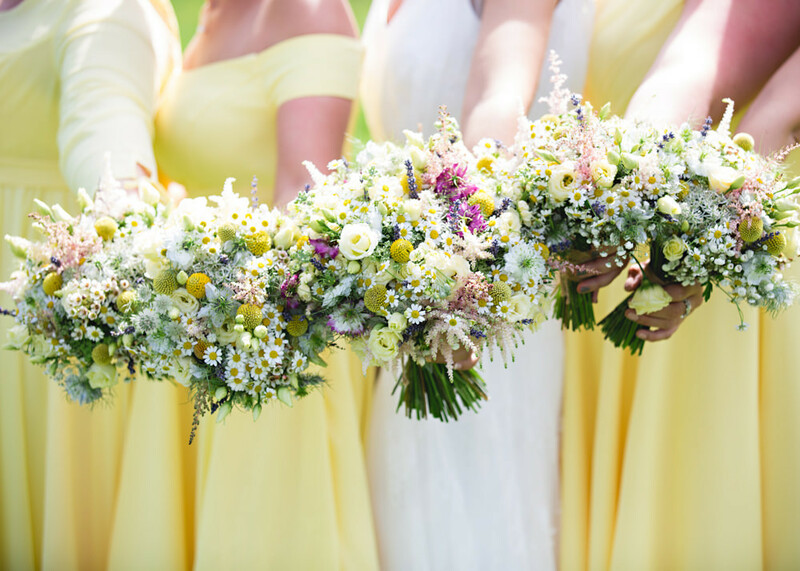 Cream bombastic spray roses, daisies, rosemary, lavender, purple phlox, ammi, pink astrantia, gypsophilia, alchemillia and fountain grass were wrapped with ribbon and twine and they smelt amazing! With the boys wearing three piece tweed suits, we wanted quite a masculine buttonhole so decided on crespidia with gypsophilia and daisies finished with twine and rosemary. Being a landscape gardener, my mum was keen to create the table centres herself and along with her friend they did a wonderful job with flowers picked out of the garden. The centre pieces were a labour of love as earlier in the year Dad and I spent a day in the shed making all thirteen from logs and twigs collected from the hillside. 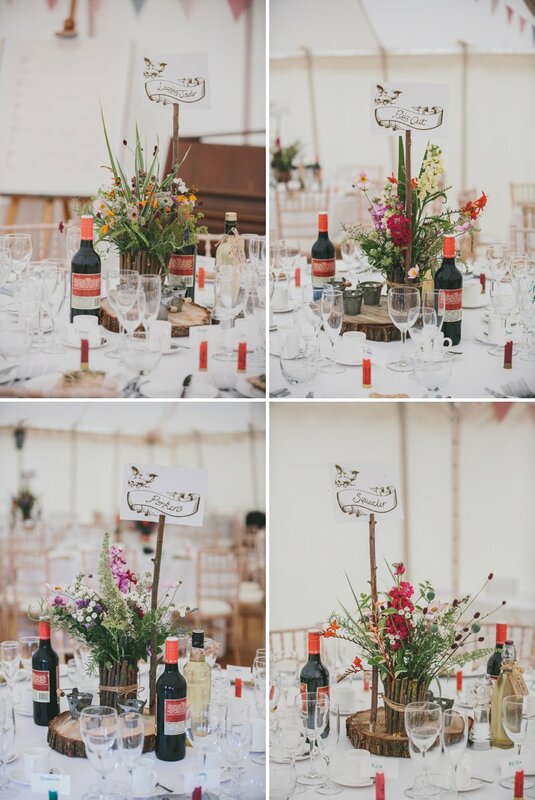 They certainly added rustic charm to each table and we were really pleased with them. One of the first decisions we made was what the boys would wear and they ended up purchasing their own three piece tweed suits from Walker-Slater in Edinburgh (their suits have even made a blog on their website!). Having each picked a different tweed design that complimented one another, the challenge lay in what the girls would wear. Initially, ideas centred on traditional floor length strapless dresses in pastel shades but we soon realised that a bold colour would work better with tweed. It was in fact my mum that picked out the dress we chose whilst she waited for me to get changed in the bridal shop! Although I wasn’t sure at first, once my bridesmaid Carrie tried it on, I realised how gorgeous they would look. 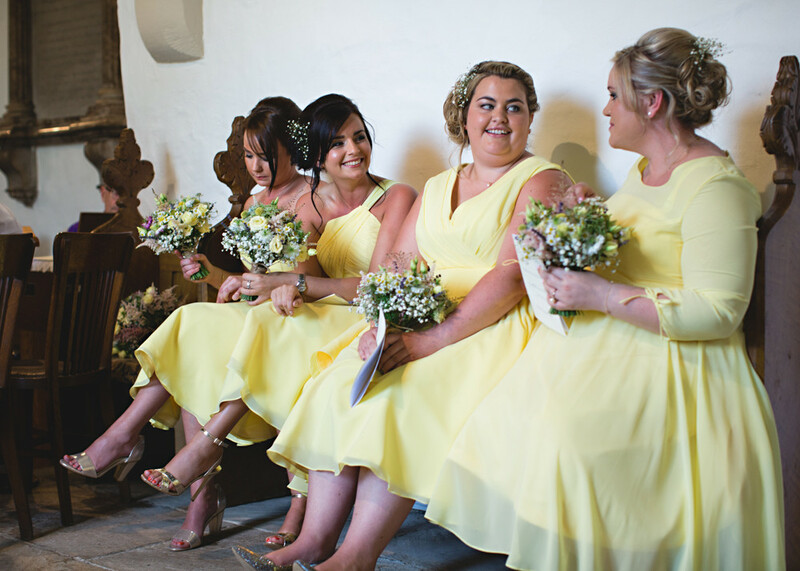 With all four bridesmaids being young and bubbly, I felt the dress we chose reflected their characters whilst at the same time not being too formal. They were designed by Wtoo and bought from the same shop I got my wedding dress. 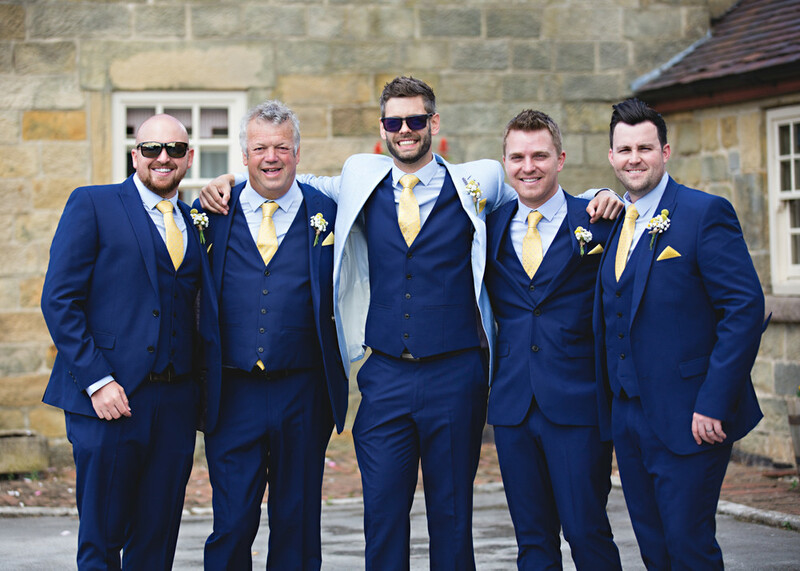 The colour was a beautiful bluey green shade called agave and we managed to get similar coloured woollen ties for the ushers. It was pot luck that everything came together on the day! The Groom was in a lovely rural green three piece tweed suit which I have to say has been his best purchase EVER judging by the amount of times he’s worn it since! He looked very dapper and I had the biggest smile on my face coming down the aisle. We weren’t keen on having a strong colour scheme with everything matching so there were no restrictions when it came to what tie or shirt he wore. His tweed suit had a lovely plum lining so he got a woollen tie to match and with it wore a pair of light brown brogues and his late father’s gold pocket watch. It was a traditional but quirky look and one he pulled off very well as did all the other ushers in their tweed suits. It was a bit of a gamble wearing tweed on a summer’s day but thankfully it wasn’t baking hot! Choosing McKinley-Rodgers to capture our special day has to be without a doubt, the best decision we made. The photos speak for themselves…those two rock! Not only were we blown away with their images but on the day itself, they were great fun to be around and made it very easy for us to relax and be ourselves in front of the camera. Many of our friends and family actually thought they were wedding guests and that was what was so good about them, they didn’t impose themselves like many photographers often do. We really can’t thank them enough. As a result of major unexpected drama (long story!) they went to the effort of recording a vast majority of the day and creating a short video which captures everything so beautifully, we love it! 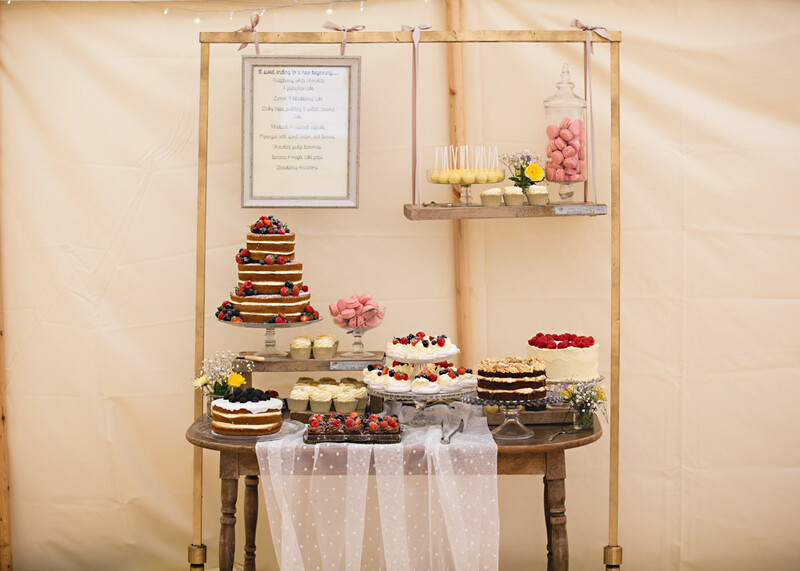 With a family of enthusiastic bakers, the wedding cake was very much a home-made team effort. We came up with plenty of ideas but to fit in with the rustic theme, we decided on a ‘naked’ cake – a traditional shaped wedding cake but made from sponge without the icing. Mum made the three tiers of Victoria sponge which was then beautifully decorated by my 16 year old cousin who created a dozen or so intricate edible roses which looked so real! Fresh strawberries were also added and the cake was filled with buttercream made by my aunty. Not only did it look superb, it was absolutely delicious! We placed the cake on top of a log to tie in with the centre pieces. The band were the choice of the groom’s Best Man, his brother. They were called Fat Chance and having already heard them at a friend’s wedding the year earlier he knew they would suit the sort of music we wanted. Being fans of all kinds of music, entertainment was hugely important to us but having only heard a couple of clips of the band on-line, we put a lot of trust in the best man. He also kindly offered to pay for the band as a wedding gift so we couldn’t really say no! They certainly didn’t disappoint! 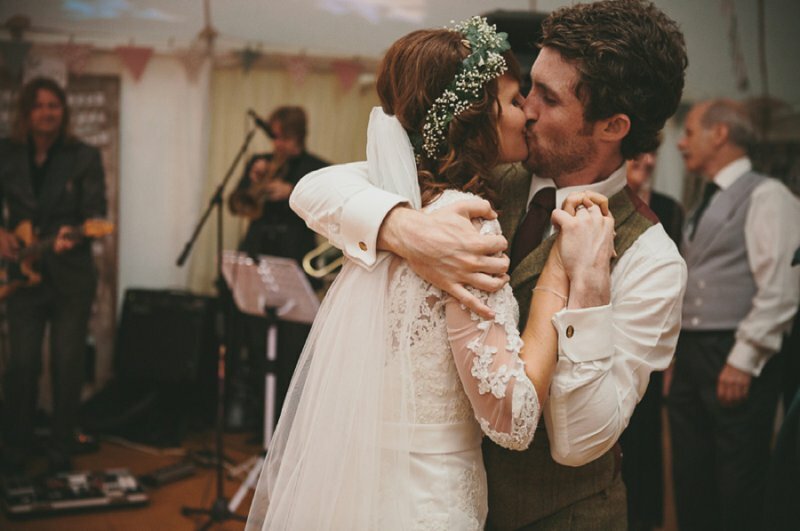 The dance floor was literally full from the first song until the last – even the band commented that it’s a rare sight at weddings as it normally takes a while for people to warm up. They definitely struck a chord with us and everyone there. Although we’re both really into music, we don’t share any one specific song that holds a special meaning so we spent quite a bit of time deliberating over what song to dance to. We had all sorts of ideas including a song we could lindy hop to but that was short-lived as neither of us can lindy hop! We considered scrapping the first dance all together but in the end we chose Al Green’s Let’s Stay Together as lyrically it fitted the bill and it wasn’t too slow to dance to. We didn’t want to dance to a recording either so it had to be something the band could play live. We didn’t rehearse it once so it was all on impulse although I think we spent most of the song kissing and hugging so to avoid having to dance! We didn’t go down a traditional favours route. It is usually quite a large expense and we’ve been to a number of weddings where many of the favours are left behind. So instead we distilled 6 litres of home-made Summer Fruits Gin and left it by the bar with a load of shot glasses for people to toast to whatever they wanted during the evening. It went down an absolute storm, was personal to us and our tastes. Like us, a lot of our friends and family love gin so it was ideal. It was also a good incentive for people to add their fingerprint to a huge piece of sheet music, ‘Bring me Sunshine’ designed by my friend Alicia. This was our version of a guestbook, and using the fingerprint tree concept, we got guests to put their little fingers in different coloured ink pads and place them on a note assigned to them. It’s definitely my favourite creation from the day and we now have it framed on our wall. The beauty of having our wedding on my parent’s farm was that we could do whatever we liked. Our aim was to keep things relaxed, rustic and simple and we did just that with some wonderful help from close friends and family. The traditional marquee was such a beautiful open space. We decorated it with bunting made by our mums and flowers from the garden that we put in old milk churns. More bunting was hung around the farm along the fences and up the driveway. We had hundreds of metres of the stuff! The table plan was in hindsight a bit of a mistake as I ended up drawing every single guest and sticking them onto parcel tags which we then hung on an old door. It looked great but the number of hours spent drawing could probably have been used more wisely! Being in the middle of a field, there was plenty of space for the kids to run around and play and towards the end of the night, the adults too! Hay bales were covered with tartan picnic rugs for guests to sit on and relax during the champagne reception and thankfully the sun came out! The champagne was special as we were kindly taken over to the Champagne region in France by the groom’s mum and step-dad where we got to sample some fizz before buying the one we liked best. We ended up with loads including a magnum for each table for the speeches. It certainly went down a treat. We couldn’t go without mentioning our fantastic caterers Red Olive who on the run up to the day and the day itself, couldn’t do enough for us. Charlie and his team were so professional and nothing seemed to be an issue. The meal was relaxed and informal with an antipasti starter of continental meats, olives and artisan breads, followed by rotisserie lamb which was reared on the farm by my uncle. It was all delicious and to fuel our late night dancing, they provided some fantastic curries – plenty of people went up for seconds! What made our day so special was that it was very personal to us. The tiny details were really appreciated by our guests and it made all those hours of planning and hard work worth it. My husband and I were a pretty good team. 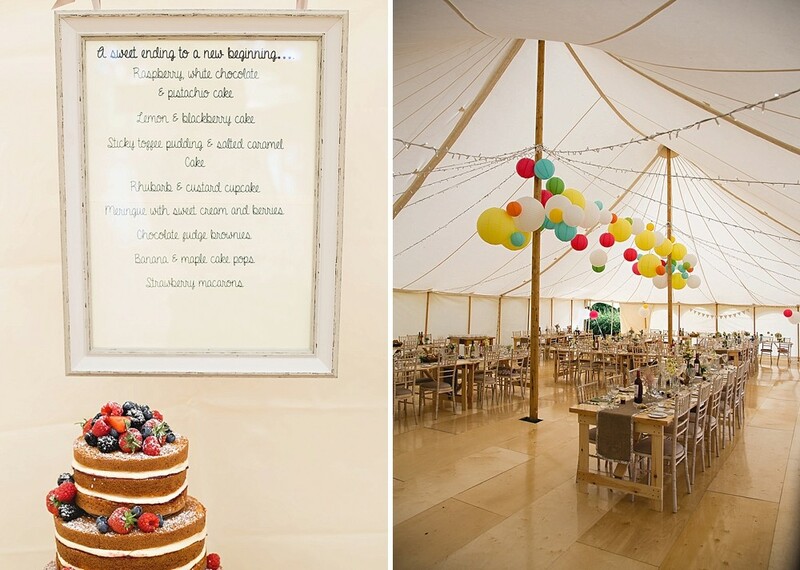 Being an events manager by trade, he kept on top of all the suppliers and had lots of lovely colour coordinated spreadsheets whilst I could concentrate on the creative elements. 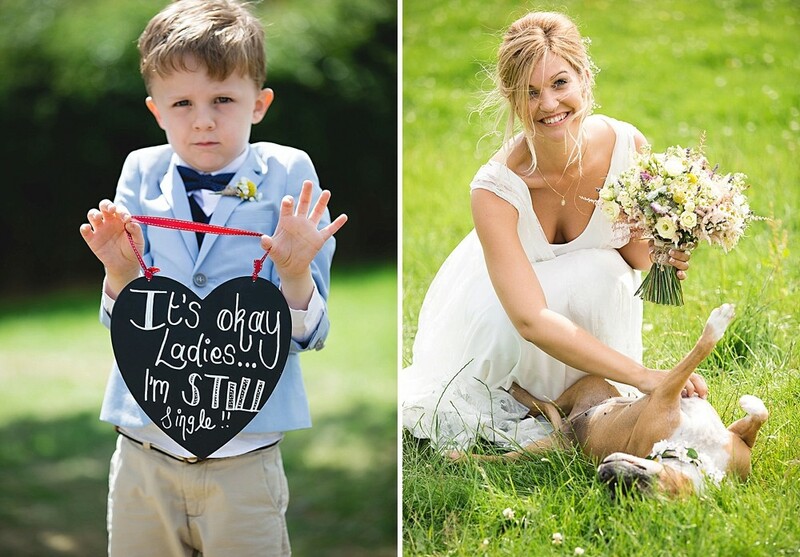 Pinterest was a big help as was the many beautiful real weddings posted on this blog! Looking back, I definitely took on too much so my advice like many other brides would be to only take on as much as you can. 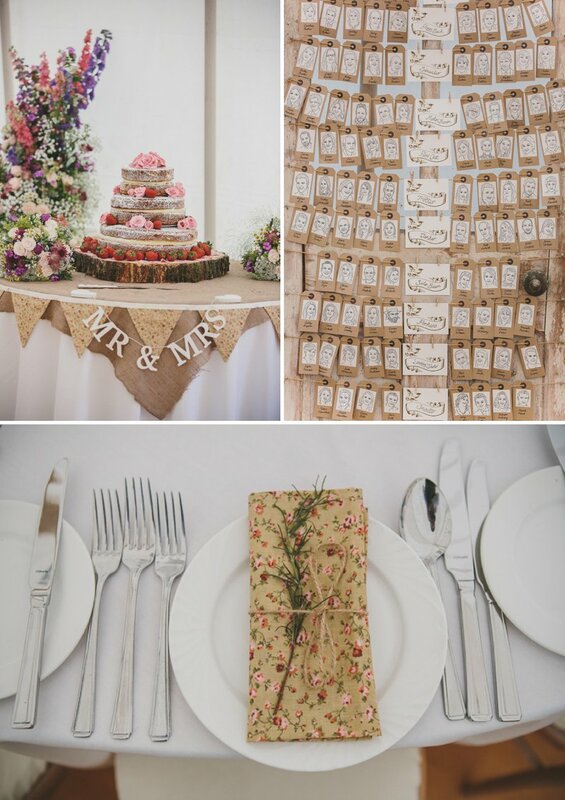 Our wedding was very much a homespun affair, we couldn’t have done it without the fantastic contributions made by our parents and their home-made creations. Involving close friends and family is so important because they get to feel involved and make a special contribution to your day. You don’t need thousands of pounds or a grand location to make your day perfect, all you need is your favourite people in one place. That’s what made our wedding special. I tell you what, those guests at the end are clearly having a whale of a time. I quite fancy a little dance in a Gypsophila crown myself.